Written by Mae Jacobson and Madelyn Reese C H R I S J . K A L I N K O S ometimes life throws you a curveball. The WAC is here to help you hit it. Like when member Dan Titcomb ruptured a disk in his vertebrae during the summer of 2015. The WAC was on hand with a variety of solutions for the dedicated member. "The Club was a godsend," says Dan, who used the Wellness Center to recover from his injury. Three months of physical therapy, massage, B-12 shots, and hot yoga helped Dan gain mobility, reduce pain, and strengthen his injured vertebrae. Now he is fully recovered and feeling better than ever. "I'm 100 percent again," he says. "And I can golf again, which is really exciting." Dan was able to hit the links this past February, the first time since hurting his back. Since then, he has visited warmer locales for a few rounds and plans to do more golfing and traveling this summer. As a loan originator at Arboretum Mortgage in Two Union Square, Dan works across the street from the Clubhouse. Before his injury, he visited the Club daily around noon for a treadmill workout. Now he's focusing more on exercises that strengthen his core. Dan also uses the Club for business. Arboretum Mortgage holds regular meetings in Torchy's private dining rooms, and Dan sometimes brings clients to Hagerty's or Torchy's for a drink and a bite to eat. 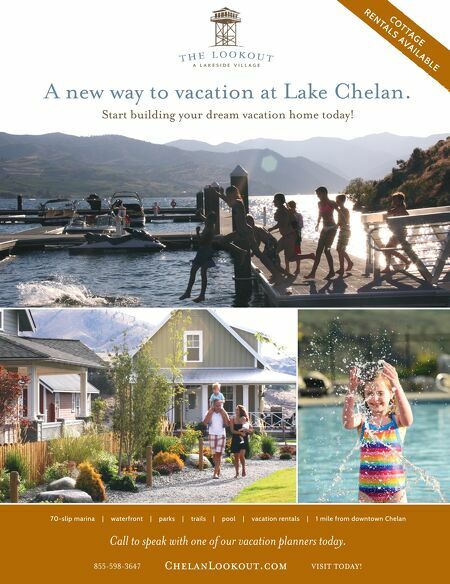 As a loan originator, Dan says he likes being a trusted contact for friends and families seeking financing. "It feels great to be there for people when they're looking to invest or buy a new home," he says. When it comes to introducing potential members to the WAC, Dan says he brings them to the Clubhouse and shows off the convenience and state-of-the-art facilities. He also talks about the Club's other perks. "The business and social benefits of the WAC are really important to me," he says. "That and the positive effect the Club has had on my health and well-being. It makes it easy for me to refer new members." 18 | Washington Athletic Club Magazine | MAY / JUNE 2016 They also grow the Club and ensure our continued status as one of the nation's premier city athletic clubs. Our Membership All-Star program honors those members who serve as primary sponsor for three or more new WAC members in a given year. MEMBERSHIP A L L -S T AR MEMBERS MAKE THE WAC! 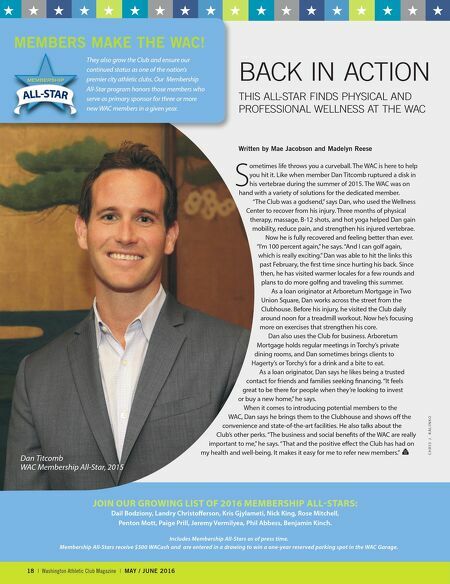 Dan Titcomb WAC Membership All-Star, 2015 BACK IN ACTION THIS ALL-STAR FINDS PHYSICAL AND PROFESSIONAL WELLNESS AT THE WAC Includes Membership All-Stars as of press time. Membership All-Stars receive $500 WACash and are entered in a drawing to win a one-year reserved parking spot in the WAC Garage. JOIN OUR GROWING LIST OF 2016 MEMBERSHIP ALL-STARS: Dail Bodziony, Landry Christofferson, Kris Gjylameti, Nick King, Rose Mitchell, Penton Mott, Paige Prill, Jeremy Vermilyea, Phil Abbess, Benjamin Kinch.